The electric bike sector will receive one of its most anticipated products next month, when Daimler makes its Smart e-bike available in Europe. 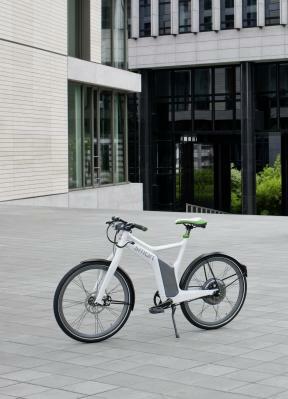 The bicycle, which the German car-maker is calling a “pedelec” (Pedal Electric Cycle) combines an electric motor in the rear wheel hub and a 423Wh lithium-ion battery to provide additional propulsion when the cyclist requires. It has a top speed of 40km/hr, a range of around 100km and the battery’s charge is supplemented with energy recovered from braking. Despite gathering more and more and users in Europe, such as in Austria, e-bikes have yet to break into the mainstream, mainly because of their relatively high costs and bulky, unwieldy design. Many commentators predict that the Smart e-bike will change this perception with a refined design akin to the Smart cars. However, the Smart styling does come at the high price of €2849, which is sure to put many potential buyers off. Nevertheless, the e-bike sector remains buoyant, with many analysts predicting that it will continue to grow over the next decade, supported by a growing amount of consumer interest and government sponsored research. Time will tell if these predictions of growth will be realised, but it will be interesting to judge the uptake of e-bikes against the uptake of electric cars.